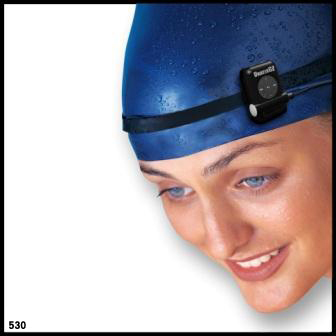 This 4GB micro-sized waterproof MP3 player radio clips on to goggles or fastens onto headband, armband, or belt for swim-anywhere, go-anywhere, pleasure. Our newly designed single port 3.5mm copper plated jack connection completely seals water out plus provides crucial long term protection. 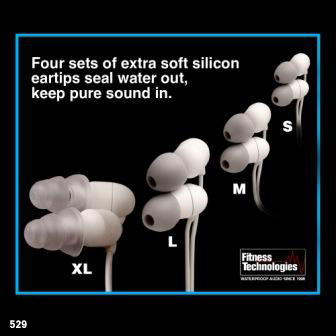 The standard size 3.5mm jack will allow you to experiment with our whole range of waterproof headphones allowing you to find the perfect fit for your ears whne swimming or surfing. 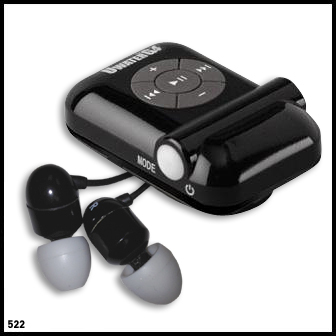 The UWaterG4 has a 1,000 to 1,200 Songs/10 Audio Books capacity (4GB), with a continuous play time of 6 to 8 hours on a single charge of its built-in high performance (1000+ cycle) Lithium-Ion rechargeable battery. Since 1996 our Waterproof Audio Technologies (WAT) were featured in the New York Times, LA Times, Men's Health (Europe), Swim World, Fitness Swimmer, Triathlete Magazine, CNET, CBS TV, as well as over 30 other publications. Also endorsed by the US National Sporting Goods Association. -- Play Time: Continuous 8 HRS. Do not be fooled by cheap imitations. They won't last beyond your first lap. Since 1996 our engineers have invested years of R&D on improving Waterproof Audio Technologies (WAT), optimizing in-the-water audio reception, tuning and controls.